Samarah Fine Art is proud to introduce new and original artwork by Chad Poppleton, Rusti Warner and Rolf Zillmer at their September show. Their pieces will be on display at Samarah throughout the month of September and a celebratory opening reception will take place on Thursday, September 4th from 6:00PM – 9:00PM, as part of the 2008 Whitefish Gallery Nights. All are welcome to stop by and enjoy a memorable evening of wine and hors d’oeuvres by Ali Caters. “Chad, Rusti and Rolf have been friends of the gallery for many years. Each of them has a unique style and voice as artists, so this show is a time for us to honor them and to showcase their talent.” Stated Rob Stern, Gallery Owner. Chad Poppleton is a resident of Cache Valley, Utah, where his interest in art began at an early age. As a child, Chad spent most of his time at his family’s ranch where he was able to study and observe wildlife first hand. His respect for and affinity with nature has had the greatest creative influence on his artwork, and has made his paintings a true refection of his love for animals and the outdoors. 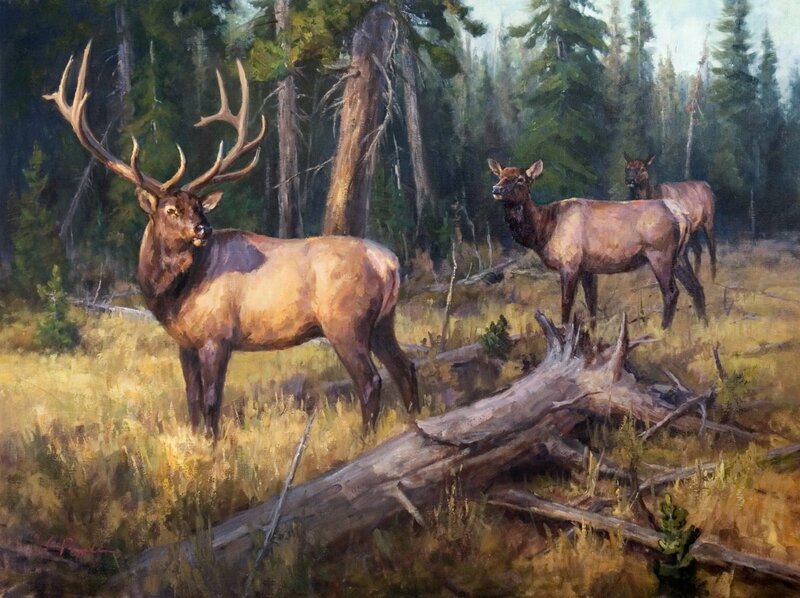 Chad’s ability, not only to represent his subjects accurately, but to also capture their character, is what distinguishes Chad as a significant wildlife artist in his own right. Rusti Warner is a Montana artist who grew up in Havre near several Indian reservations. Her time and friendship with those in the Native American community gave Rusti firsthand insights into the modern American Indian life. It was from this experience that Rusti’s interest in portraiture, artistic anatomy and oil painting began. Today, Rusti’s signature use of tonality infuses her paintings with a moody quality that makes her artwork so movingly sublime and peaceful. Rolf Zillmer currently lives in Libby, Montana, and comes from a family of fellow artists. After spending the greater part of his life working in the arts, Rolf received an opportunity to photo-illustrate America’s national parks. This exposure to natural beauty refueled Rolf’s passion for painting and shifted his focus exclusively to fine art. Today, living in Montana, with its endless supply of reference material, has given Rolf the ability to develop and sharpen his skill as an acclaimed landscape painter.